Udonis Haslem could be headed to Cleveland, according to an Instagram post made by his son. That’s because the Heat forward’s son, Kedonis Haslem, recently posted a photoshopped image of his father in a Cleveland Cavaliers jersey. The 14-year veteran has been the captain of the Miami Heat for many years and was one of the leaders during and after the Big 3 era. Haslem has won three NBA championships, while spending his entire professional career with the Heat. Earlier this week, Tim Reynolds of the Associated Press had reported that Cleveland was keeping an eye on Haslem as a possible free agent target. 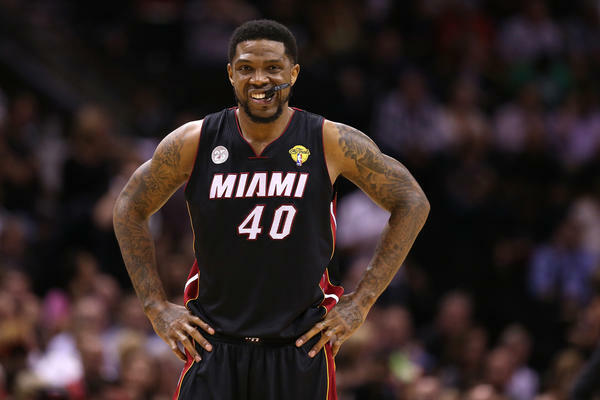 Udonis Haslem, who wants to stay in Miami, is now on the radar screen of the Cleveland Cavaliers. A conversation, at least, is likely. As Reynolds notes, the Florida native wishes to stay in Miami, but the Heat might only be able to offer him a minimum contract worth around $2.3 million. After losing franchise star Dwyane Wade last season, losing another pillar like Haslem would be devastating for the team’s fan base. Atreya is currently attending Purdue University and loves to watch and follow the NBA. He grew up in Alabama so he loves his Auburn Tigers just as much as he does the Miami Heat. He’s been a huge fan of the team since that magical 2006 title run and still believes Dwyane Wade can drop 50 on any given night. He’s extremely excited to be writing about the team he loves and keeping Heat Nation up to date on all things Heat. You can follow him on Twitter @atreya_verma.